NEW BRITAIN - Election Day is here, and voters across Connecticut will be casting ballots in several local, state and national contests today. Polls will be open from 6 a.m. to 8 p.m. Voters will be choosing a new governor, attorney general, secretary of state, treasurer and comptroller, as well as casting ballots in all state representative and state Senate races. Midterm elections for all U.S House of Representatives seats and one U.S. Senate seat will also be decided. Polling locations can be found at www.NewBritainHerald.com or the city’s of New Britain’s website. In Connecticut, voters are allowed to register to vote on Election Day. Those still seeking to register should bring proof of residency as well as identification to City Hall. A recent utility bill, a paycheck or any document which shows voters’ full address may be presented as proof of residency. Registrars around the state have been encouraging people to vote early. 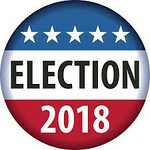 Sue Larsen, president of the Registrars of Voters Association of Connecticut, said anyone planning to register on Election Day should arrive at the registrar’s office by 7 p.m. to ensure their name gets into the system. Candidates have flocked to the city in recent weeks as Election Day neared. Last week, the entire statewide Democratic slate visited the city for a meet-up at the New Britain Senior Center and a rally with local unions. Ned Lamont and his running mate, Susan Bysiewicz, helped hand out candy downtown on Halloween, and unaffiliated lieutenant governor candidate Monte Frank took part in the action as well. Bob Stefanowski visited Little Poland on Saturday as part of his statewide tour, and Frank made a campaign stop in New Britain’s Polish neighborhood Monday. Election results will be updated throughout the evening on www.NewBritainHerald.com . Posted in New Britain Herald, New Britain on Monday, 5 November 2018 21:11. Updated: Monday, 5 November 2018 21:14.